You are here: Home > Blog > Flora & Fauna > Plant defences and toxins. A number of our native plants contains toxic chemicals. One reason that plants produce such substances is that they help protect against herbivory, i.e. being eaten by various grazing animals (these may vary from sheep, cows, horses to a variety of phytophagous (plant eating) insects). Some white clovers (Trifolium repens), for example, contain a chemical that releases cyanide when the leaves are crushed or eaten (under the influence of an enzyme, linamarase) - this affords some protection against being eaten by slugs and snails. 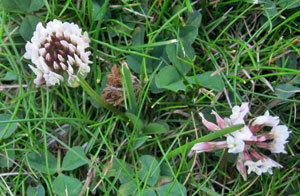 White clover with this form of defence is known as the cyanogenic form. Cyanogenic forms are not to be found at high altitudes where frosts are common, as ice crystals form within the cells and the physical damage by the ice results in the release the cyanide - killing or injuring the plant. The occurrence of different forms (morphs) of a species is known as polymorphism, and is under genetic control. Alkaloids are usually bitter tasting, nitrogenous compounds - many of them derived from amino acids. Often alkaloids are very active pharmacologically speaking - examples are nicotine (from tobacco), morphine (from particular poppies) and atropine (from deadly nightshade and mandrake). In the past, nicotine was used as an insecticide and atropine had ophthalmic uses; morphine and its various derivatives was and is used in pain relief. Glycosides, as their name suggests contain a sugar that is complexed / joined to another chemical, such as cyanide, as in white clover or bitter almonds (amygdalin). Since the description of cyanogenesis in plants in 1803, cyanide production has been recognized in some 3000 species of higher plants (angiosperms & gymnosperms). However, the source of the cyanide has been identified only in (circa) 300 species. Saponins are compounds which when shaken with water give rise to a froth. They, too, are glycosides. The term saponin comes from the soapwort Genus : Saponaria; the root of which was used as a 'soap'. In certain sapindaceous seeds, the hydrogen cyanide may arise from cyanolipid hydrolysis (i.e the breakdown of fatty materials). Many plants of hedgerow and woodland plants were used in herbal medicine in the past, but now must now be viewed with considerable caution or positively avoided. 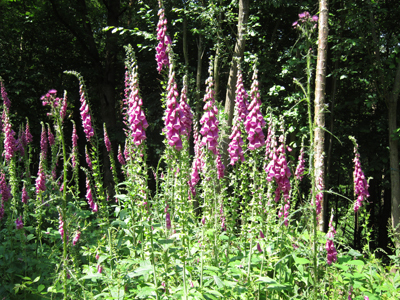 For example, foxglove (Digitalis purpurea), often found in woodland, was 'recommended' for those 'who have fallen from high places' (Gerard), and the bruised herb or its juice for 'scrofulous swellings'; bruised leaves might be used for old sores and ulcers. However, the plant actually contains potent cardiac stimulants - digitalis and digoxin, and should be viewed with some caution. 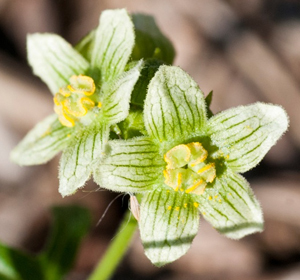 White Bryony - Bryonia alba (also sometimes called English Mandrake or false mandrake, wild vine, wild hops, or wild nep.) 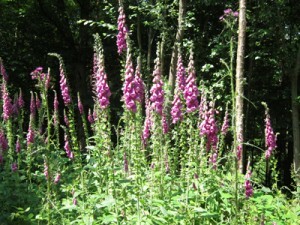 is a perennial climber (often found in hedgerows) that can grow up to 4 m at a fast rate. It contains bryonin which is poisonous and may cause illness or death. All parts of the plant, and particularly the root, are poisonous. Ingestion can cause severe diarrhoea and vomiting (resulting in death). Livestock may be poisoned by consuming the fruit and leaves. 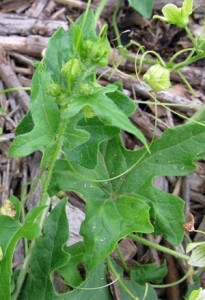 White bryony can form a thick, 'dirty white' tuberous root. The branching stems bear heart-shaped, five-lobed, rough leaves (see image above). It is a climber and often grows to a height of 10 feet using its spiral tendrils emerging opposite to the leaves. The plant is found in hedgerows and on the edges of woodlands. White bryony produces small greenish-yellow / yellowish flowers with green veins (see adjacent image) that grow in clusters at the leaf axils between June and August. The flowers are pollinated by bees. An alternative defence against being eaten that is adopted by other plants is spines, prickles and thorns - a physical as opposed to a chemical defence. 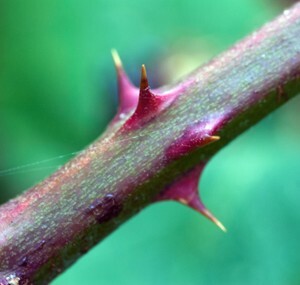 These term, thorns and prickles, are often used interchangeably, but botanically speaking, thorns are derived from shoots, whereas spines are derived leaf structures. Prickles are epidermal structures - so can occur anywhere on the plant. 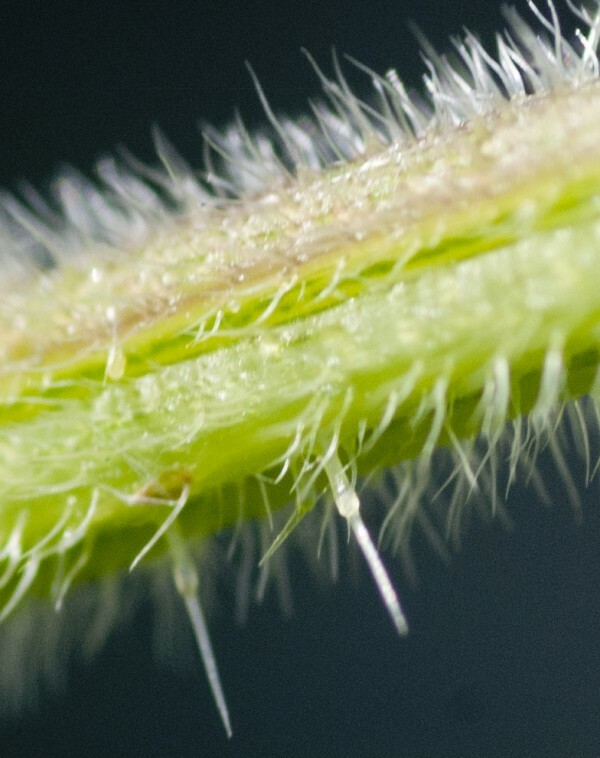 Trichomes are again epidermal outgrowths of various kinds - many are hair-like structures, some of which are sticky like those seen on Sundew (Drosera sp) - see adjacent image. 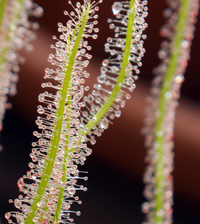 Sundews lure, capture, and digest insects using the stalked sticky glands covering their leaf surfaces. The insects are used to supplement the poor mineral nutrition of the soil in which they grow, providing nitrogen compounds. Other glandular hairs produce 'essential oils' - such as those seen in the mints and other members of the Lamiaceae. How can I get rid of Bracken (Ferns ) rife in my woodland?